UEFI support becomes relevant for drives >2TB. It must be present to enable booting from such large partitions provided the other prerequisites (64-bit Windows and GPT) are met. GPT will automatically install the EFI System Partition (ESP), which contains the boot loader, EFI drivers, and all other necessary files for booting the system (such as boot.ini, HAL, and NT Loader). It utilizes the GUID Partition Table rather than the master boot record. The ESP is 1% of the drive capacity, or a minimum size of 100MB and a maximum size of 1,000MB. Chatwin says: Even if your system is GPT-compliant and created using the necessary partition, you will still need UEFI support to be able to boot from a large volume (UEFI = Unified Extensible Firmware Interface). Long LBA addressing increases the number of bytes used to define the LBA in the Command Descriptor Block (CDB). System must support at least 16-byte Command Descriptor Blocks (CDBs) or 32 bytes (Protection Information commands only) and Dynamic Sense Data to access the LBA counts above 2.1TB. Eight LBA address bytes are provided in 16- and 32-byte CDBs. This is a doubling of the 4 bytes in 10-byte commands (http://www.seagate.com/docs/pdf/whit…_readiness.pdf). 1. Windows XP Professional with SP2 for Windows Server 2003 64-bit, Vista 64-bit, Windows 7 64-bit for GPT. 2. UEFI booting support since Windows Vista with Service Pack 1 (64-bit only). 3. Motherboard with UEFI 2.x implementation for boot drives on a partition larger than 2.2 TB. 4. Windows 7 (SP1) is supposed to understand AF drives, and correctly aligns partitions. Without the updates in a hotfix, Windows can’t detect the drive’s physical sector size, and Windows Update (and some other features) fail. Microsoft explanation and hotfix link: An update that improves the compatibility of Windows 7 and Windows Server 2008 R2 with Advanced Format Disks is available. 5. SP1 with hotfix aren’t correctly updating the storage driver, so it can’t report sector size to Windows. The clue here is that fsutil still reports “bytes per physical sector” as “<Not Supported>”. You can fix this issue to manually install the latest Intel driver (9.6 or later): Intel® Rapid Storage Technology. Use LSoft Active Boot Disk Suite (based on WinPE 3.1) to create a partition with an offset of 2048KB, format with 4K sectors and reboot. Replace with XP64 SP2 installation DVD and install without altering the partition parameters. After final installation reboot and use Paragon Partition Manager Server (WinPE 3.0 recovery environment) to convert cluster size from 4KB to 64KB. Shutdown and start from primary HDD partition. Paragon just introduces a new solution: Migrate to UEFI. “It’s a simple four-step Copy Hard Disk Wizard that transfers a 64-bit Windows Vista/7 initially installed on an MBR disk in the BIOS mode to a GPT disk and the UEFI mode, thus opening up all benefits of the GPT+UEFI configuration, including support of a high-capacity 2.2TB+ hard drive for use as the primary system HDD. Home and small-office users who try to move their 64-bit Windows Vista or Windows 7 software environments from the dated MBR/BIOS configuration to a modern GPT/UEFI platform find that you can’t just change the partitioning scheme and enable UEFI without reinstalling the operating system from scratch. The problem is that Windows Disk Management supports conversion to GPT for empty drives only, so you’ve got no way of converting the system drive to GPT without losing data. Besides Windows Management tools do not provide an option to adjust boot files for UEFI, making it impossible for users transferring established data or system components within a single computer directly from a BIOS boot mode to a UEFI-based mode. “According to this link the theoretical lower limit on NAND cells appears to be around 20nm. One of the big reasons for this limitation is that as cells shrink in size they are, naturally, closer together. However, the voltage required to program a cell remains about the same (typically 12V). This means that the power density increases (amount of power in a given area) increasing the probability that the voltage will disturb the neighboring cells causing data corruption. Consequently, increasing the density of cells can be a dicey proposition, hence the lower limit. Recently, IMFT (Intel-Micron Flash Technologies) LLC announced that it had begun sampling 2 bits per cell (MLC) NAND flash chips that have been manufactured using a 25nm process. This announcement is significant because of the increased density and how close the density is getting to the theoretical limit. Plus the fact that one of the best performing SSD drives is from Intel, one of the participating companies in the LLC, and we can see a fairly significant shift in technology. IMFT is a joint project by Intel and Micro to develop new technologies around Flash storage (primarily NAND). The project started with production several years ago with a 72nm process. They then moved to a 50nm process in 2008 followed by a further reduction to a 34nm process in 2009. It is the 34nm process that current Intel SSDs utilize (Intel X25-M G2). The 34nm process produces a 4GB MLC NAND chip with a die size of 172 mm2.The new 25nm process is targeted for a first product which is an 8GB MLC NAND flash chip with a die size of 167 mm2. So going from 34nm to 25nm doubles the die density. In addition to the doubling of die density the new chips will have some other changes. The current 34nm generation of chips have a page size of 4KB and 128 pages per block resulting in a block size of 512KB. The new chip will have a page size of 8KB and 256 pages per block. The means that the new block size is 8KB * 256 = 2,048KB (2MB). This change in block size can have a significant impact on performance. Recall that a block is the smallest amount of storage that goes through an erase/write cycle when any single bit of the block is changed. For example, if any bit within the block is changed then the entire block has to first have the unchanged data copied from the block to cache and then the block is erased. Finally the updated information is merged with the cache data (unchanged data) and the entire block is written to the erased block. This process can take a great deal of time to complete and also uses a rewrite cycle for all of the cells in the block (remember that NAND cells have a limited number of rewrite cycles before they can no longer hold data). “Disk performance may be slower than expected when you use multiple disks in Microsoft Windows Server 2003, in Microsoft Windows XP, and in Microsoft Windows 2000. For example, performance may slow when you use a hardware-based redundant array of independent disks (RAID) or a software-based RAID. 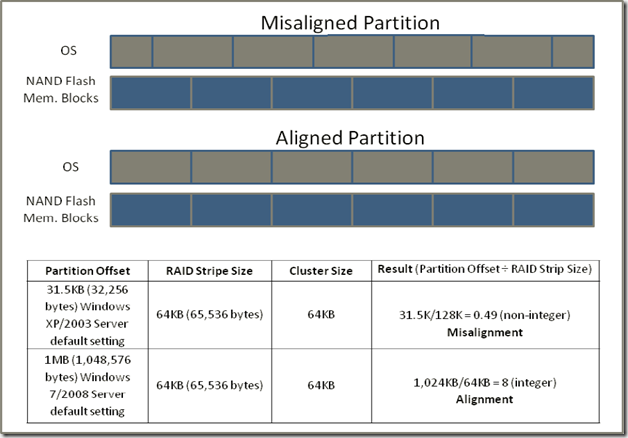 This issue may occur if the starting location of the partition is not aligned with a stripe unit boundary in the disk partition that is created on the RAID. A volume cluster may be created over a stripe unit boundary instead of next to the stripe unit boundary. This is because Windows uses a factor of 512 bytes to create volume clusters. This behavior causes a misaligned partition. Two disk groups are accessed when a single volume cluster is updated on a misaligned partition. “NAND flash devices are divided into erasable blocks composed of multiple pages (up to 256 pages per block, and up to 8KB per page). A flash block must be fully erased prior to re-writing, and a single-block erase process can take up to several milliseconds. The write speed may suffer a great deal if the SSD controller has to perform unnecessary block erase operations due to partition misalignment. Proper partition alignment is one of the most critical attributes that can greatly boost the I/O performance of an SSD due to reduced read modify‐write operations. With 8K as the ideal sector size for flash memory (4K SLC), this is in my opinion the best choice when you want the fastest performance for your SSD (Indilinx, Samsung, JMicron controllers), unless you’re more concerned about maximizing your storage capacity at any price. And not to forget: a longer lifespan, for reducing a lot of overhead and fragmentation compared to the standard NTFS formatting of 4096 bytes. Keep in mind that this setting was default in a time that hard disks were limited to 2-4 GB, instead of 2 TB in this time and age.